Reporter Sharon McNary opts in to NotifyLA, the city's emergency alert system. Wildfires, earthquakes, mudslides — living in disaster-prone Los Angeles, we're all watching out for the next emergency. But how do you find out about them as they're happening? If you're not on social media or watching TV as a large fire develops, there's a good chance you might not know about it until you spot it coming down a hill toward your home. The good news: L.A. has emergency notification systems designed to text or phone or email you. The trouble: there are several of them, with the police department, the fire department and the city's emergency management department each doing their thing — and each requiring you to opt in to a different system. 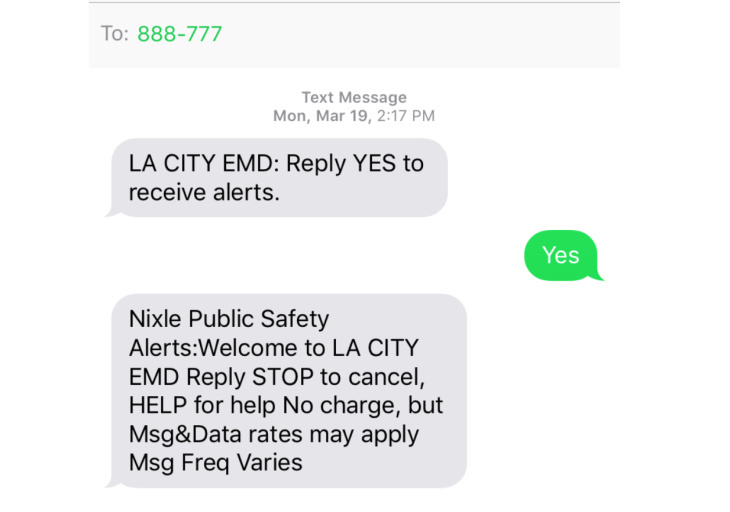 On Tuesday, a new audit by the L.A. City Controller's office said emergency officials need to overhaul the way they communicate alerts to the public and make better use of the city's official system, NotifyLA. WHY DON'T PEOPLE USE NOTIFYLA? NotifyLA is run by the Emergency Management Department and is available for all emergency responders to use to notify the public. But for years, police and fire officials have largely ignored or underused it, Controller Ron Galperin said. To illustrate just how siloed first responding agencies had become, Galperin analyzed the 2017 La Tuna Fire, the city's largest fire in a half-century. Fire and police officials sent out hundreds of messages on social media, the LAPD Nixle system and Twitter. However, not one message was sent on NotifyLA. The public isn't using the system either. The need to opt-in to receive alerts has kept the system from wider public acceptance. Fewer than 200,000 have subscribed to alerts in a city of nearly 4 million people. Not exactly critical mass. On top of that, when alerts are received, they're often in English and not duplicated in Spanish or other languages that Angelenos speak. Only four messages from NotifyLA sent since its 2014 inception were in Spanish, and none were in other popular languages like Korean, Chinese, Tagalog, or Armenian. For comparison, the emergency notification system used by Los Angeles Unified School District communicates in five languages. The problem was not a lack of interest in communicating with people who don't speak English. It's just that the messaging software does not accommodate other languages easily, L.A. Fire Department Chief Deputy Al Poirier said. The city is switching to a new digital platform to address those issues, he said. Leaders of the police and fire departments now agree that they need to unify their messaging behind NotifyLA. However, they won't be giving up on supplemental communication channels like Twitter and Facebook anytime soon. They are drafting standard procedures for when to send messages and what they should say, but it's unclear when that will be completed. SO HOW DO I SIGN UP FOR THE RIGHT ALERTS? For now, there is still no one place to get all the right alerts. Depending on where the emergency is happening, following the local police and fire departments on Facebook and Twitter may be your best bet. Another option is signing up for LAPD's Nixle, which will get you all the public safety alerts in your area. And to cover your bases, you can still opt in to NotifyLA alerts. Just text your zip code to 888-777. You can also sign up online at the NotifyLA opt-in page.